Often the development of a computer vision project involves tweaking parameters of a technique to achieve the desired outcome. These parameters could be the thresholds of an edge detection algorithm or the brightness of an image, for instance. If you don’t use any graphical user interface (GUI) for tweaking these parameters, you need to stop your application, adjust your code, run the application again, evaluate, and repeat until it is good. That is tedious and time-consuming. There are plenty of great GUI libs, e.g. Qt and imgui, that can be used together with OpenCV to allow you to tweak parameters during runtime. For using Qt with OpenCV on a Mac, check out this post. There might be cases, however, where you don’t have (or don’t want) the dependencies of such libs, e.g. you have not compiled OpenCV with Qt support, or you can’t use OpenGL. In such situations, all you need is a quick and hassle-free way of creating a GUI to tweak your algorithms. That is the purpose of cvui. It is a C++, header-only and cross-platform (Windows, Linux and OSX) UI lib built on top of OpenCV drawing primitives. It has no dependencies other than OpenCV itself (which you are probably already using). One line of code should produce one UI component on the screen. A few of the UI components available in cvui. In order to use cvui, you just include cvui.h in your project, give it an image ( i.e. cv::Mat ) to render components and you are done! 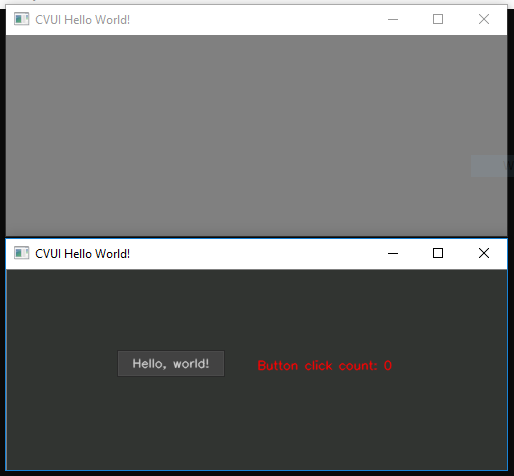 #define WINDOW_NAME "CVUI Hello World!" // Init a OpenCV window and tell cvui to use it. // The button was clicked, so let's increment our counter. // Show how many times the button has been clicked. // Text at position (250, 90), sized 0.4, in red. Basic cvui application featuring a button and a text. Call the initialization function cvui::init() before rendering any components. Call cvui::update() once after all components are rendered. Regarding the components used in the code above, the cvui::button() function returns true everytime the button is clicked, so you can conveniently use it in if statements. The cvui::printf() function works similarly to the standard C printf() function, so you can easily render texts and numbers on the screen using notations as %d and %s. You can also choose the color of the text using hex values as 0xRRGGBB, e.g. 0xFF0000 (red), 0x00FF00 (green) and 0x0000FF (blue). Now let’s build something a bit more sophisticated, but as easily as before. The application applies the Canny Edge algorithm to an image, allowing the user to enable/disable the technique and adjust its threshold values. We start by creating an application with no UI elements. The use of the Canny Edge algorithm is defined by a boolean variable (use_canny), while the algorithm thresholds are defined by two integers (low_threshold and high_threshold). Using that approach, we must recompile the code every time we want to enable/disable the technique or adjust its thresholds. #define WINDOW_NAME "CVUI Canny Edge"
// Should we apply Canny edge? // Yes, we should apply it. // No, so just copy the original image to the displaying frame. Basic UI to allow the use (or not) of Canny Edge. It might be difficult to see the rendered checkbox and its label depending on the image being used, e.g. image with a white background. We can prevent that problem by creating a window using cvui::window() to house the checkbox. A more pleasant UI with the use of cvui’s window component. // for the Canny edge algorithm. The cvui::trackbar() function accepts parameters that specify the minimum and maximum values allowed for the trackbar. In the example above, they are [5, 150] for low_threshold and [80, 300] for high_threshold, respectively. Final result of using cvui to create a UI to adjust Canny Edge thresholds. The cvui lib was created out of a necessity. It was not designed to be a full-blown solution for the development of complex graphical applications. It is simple and limited in many ways. However, it is practical, easy to use and can save you several hours of frustration and tedious work. If you like cvui, don’t forget to check out its repository on Github, its documentation and all example applications (buildable with cmake). If you liked this article and would like to download code (C++ and Python) and example images used in all posts of this blog, please subscribe to our newsletter. You will also receive a free Computer Vision Resource Guide. In our newsletter, we share OpenCV tutorials and examples written in C++/Python, and Computer Vision and Machine Learning algorithms and news. Should we build CVUI as this link https://dovyski.github.io/cvui//build/ says, or can we directly use cvui.h file ? im confuse how to build this library. Also i want to know that are there any changes should do in MakeList file ? Hi! cvui is a header-only lib, which in practice means you just put cvui.h along with your code and it will work. You don’t have to build it, only compile your code normally. The link you mentioned contains instructions to build the example programs that come along with cvui. You don’t need them for your application. Nvm, that was in the debug mode in VS2017, I changed it to release mode and it is working perfectly. Any idea, why it is behaving so in debug mode ? are we rendering a “cvui” over the OpenCV window to get the functionality ? Are you still facing that problem? If so, could you please open an issue on cvui’s Github repo (https://github.com/Dovyski/cvui/issues)? Impressed CVUI works great so far. Except I need it to not only feature controls but host video frames with a thread. Right now they appear side by size when sized correctly but becomes annoying if they overlap. Do you have any advice or examples to feature video in the window? cvui works by rendering all its components into a frame, e.g. cv::Mat. What you could do is read each frame of your video and then display into the cvui frame using cvui::image(). I think that could work for your needs. I’ve got the cv::Mat. : stored as “rawImage” frame. Take a look at this guide: https://dovyski.github.io/cvui/usage/ , in particular section 3 (Render cvui components). In that guide, the “screen mat” is called frame instead of screen_mat.